Cycle Attachment quickly converts your pool lift into an aqua therapy bike. The Aqua Creek Products Cycle Attachment is an upgrade that makes exercising in your pool trouble-free and convenient. The Cycle Attachment quickly converts your lift into an aqua therapy bike. Simply slide the Cycle Attachment into place, lower yourself down into the water and enjoy hydro-therapy without ever leaving your lift! Easily adjustable to increase or decrease resistance as you feel comfortable. 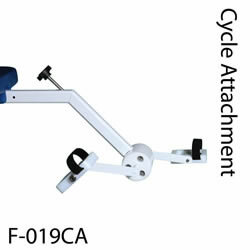 Using the Cycle Attachment with your pool lift is a great way to use your legs for physical therapy or a quick workout.